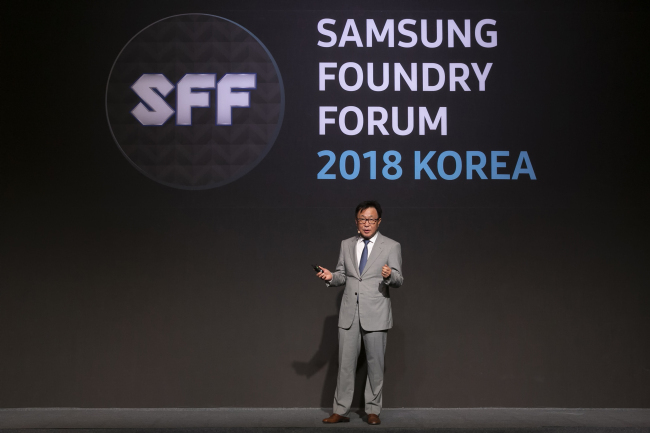 Samsung Electronics announced that it will expand collaboration with UK-based semiconductor intellectual property firm Arm to 7 and 5-nanometer FinFET process technology for high-performance computing at a foundry forum held in Seoul on Thursday. The enhanced collaboration with Arm is part of the memory chip giant’s efforts to strengthen its foundry business by providing better solutions for its fabless customers. On 7-nm Low Power Plus and 5-nm Low Power Early process technologies, Samsung will provide Arm’s Arm® Artisan® physical IP platform that will enable 3-gigahertz computing performance for high-end system on chips. “Collaboration with Arm in the fields of IP solutions is crucial in increasing high-performance computing power and accelerating the growth of artificial intelligence and machine learning capabilities,” said Ryan Sanghyun Lee, vice president of foundry marketing at Samsung. Samsung’s 7LPP process technology will be ready for its initial production in the second half of the year, the company said. The first extreme ultra violet lithography process technology, and its key IPs, are in development and expected to be completed by the first half of 2019. In addition, for Samsung’s 7LPP and 5LPE process technologies, Arm will provide Artisan POP™ IP solutions on its latest processor cores featuring Arm DynamIQ™ technology.